With the tension of the Federal Election behind us, parliament has reconvened and it’s that time of the year when study of Australia as a nation enters the curriculum. Students study various aspects of Australia’s nationhood, identity and history particularly in Year 6 to Year 9 with the support of sites such as the Parliamentary Education Office. This post contains a range of resources to further assist that study. Federation Referendums – is a collection of 13 digital curriculum resources focusing on the rounds of referendums held in Australian colonies to decide whether they would federate to form a nation. It is organised into four categories – the referendums in overview; the 1898 referendums; the 1899 referendums; and the 1900 referendum in Western Australia. The collection includes interactive learning objects, photographs, artefacts and cartoons. The Federal Parliament History Timeline is an interactive timeline that enables students to gain a perspective of the sequence of events surrounding Australia’s nationhood. It is easy to navigate and links to resources for further investigation. Federation resource by History Teachers’ Assoc of Australia (HTAA) is an Australian Curriculum lesson plan directed at Yr 6 students. It is a full unit of work with links to resources. Also recommended is the Virtual Reading Room (VRROOM) of the National Archives. Step 1) Choose the topic ‘Our Democracy’ 2) Refine it to Constitution or Federation using the drop down options 3) Click ‘browse’. Register on the site (free) and login to save these primary resource files to your personal folder. This site is an excellent resource for student exploration. National Film and Sound Archive is a site that takes time to explore but contains short historical clips that provide context and an historical perspective. See The Founding of Canberra for a reminder that in the early years of Federation, Melbourne was the national capital. The Trove database of the National Library of Australia is a rapidly expanding historical resource containing primary source material such as books, images, historic newspapers, maps, music, archives and more. In researching a topic such as Australia’s early days of nationhood, it provides access to newspapers of the day, and images that put meaning to an event. 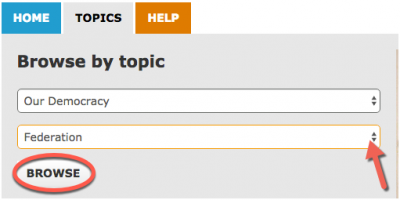 To find resources: Select topic, refine by selecting sub-topic – browse. Parliamentary Education Office provides an excellent range of videos about Federation and how the parliament works.Units of work Getting it together: From Colonies to Federation were developed by the Museum of Australian Democracy and split the topic into two parts, the Victorian story Victoria: Road to Federation and and the national story The National Story: Road to Federation. Life at the Time of Federation is another unit of work that could easily be adapted to the classroom. Federation Referendums – a collection of 13 digital curriculum resources focusing on the rounds of referendums held in Australian colonies to decide whether they would federate to form a nation. It’s organised into four categories – 1) referendums in overview; 2) 1898 referendums; 3) 1899 referendums; 4) 1900 referendum in Western Australia. The collection includes interactive learning objects, photographs, artefacts and cartoons. Road to Federation – is an easily accessible interactive telling the Federation story. It’s suitable for student use. Centenary of Federation is the story of Victoria’s role in the process of Federation and Australia’s early years as a nation. The site is no longer being maintained so there are some dead link, however, it is still a useful resource. The resources on Federation Gateway are no longer being maintained. While there is still valuable information on the site, it’s recommended that at search of the Trove database will return a better result.